Filled with tuneful pop songs,Â Nobody Loves YouÂ takes audiences on a hilarious behind-the-scenes ride through reality television and into real life. When Jeff, a philosophy grad student, joins a dating show to win back his ex, he breaks all the rules and tries to blowÂ the game wide openâ€¦ until he meets Jenny. In a world where every kiss is staged for the cameras, can two people find a real connection? The witty banter, accessible score and sweetly ironic romantic plot of Nobody Loves You charmed all of us on the committee with its wry take on the realities of reality television. It’s polished and ready to be shared with an even broader audience. Nobody Loves You received a 2011 NAMT National Fund for New Musicals Project Development Grant and recently finished its world premiere production at The Old Globe, where it also received three developmental readings since 2010. In addition, it had staged readings at Goodspeed Musicals Festival of New Artists in 2011 and the Cape Cod Theatre Project in 2008. It was part of Rhinebeck Writers Retreat in 2011. Off Broadway at Second Stage Theatre (NY) in Summer 2013. 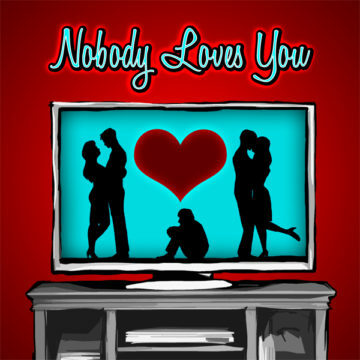 Nobody Loves You is a romantic musical comedy set on a reality TV dating show. While the show is filled with humor and satirizes pop culture, it actually takes its characters seriously and asks real questions about how romance and connection are affected by our cultural obsession with being seen. After five years in development, the show had its world premiere at The Old Globe this year and received critical acclaim from The New York Times, Variety, The Los Angeles Times and The Wall Street Journal. The show is a smart, contemporary comedy that looks at a timeless theme how you find real connection in a world of forced personalities. Though it takes a look at pop culture, it is suitable for all ages. We found that audiences at The Old Globe who had never seen a reality TV show still loved and connected with the musical. While the show takes place on the set of a reality TV show, the show can be done very simply. The production at The Old Globe was successfully realized with minimal scenery, in the round and without video or projections.